Angular contact ball bearings have a greater number of balls and higher capacities than deep groove ball bearings with the same boundary dimensions and are suitable for higher loads and speeds with proper lubrication. 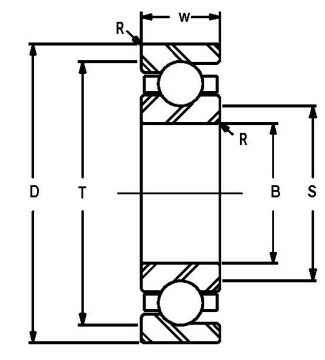 However, because of the absence of a flange on one side of the outer race, they are capable of supporting thrust loading in only one direction. This is why most applications employ two of the same bearing bearings facing opposite directions, often as a duplex pair. To obtain American BAC bearings capable of duplex mounting, they must be ordered “flush ground”, designated by the “G” suffix. “G” basically means “No axial clearance, no preload.” In cases where the tandem mounting is required, another bearing with thrust capability is usually employed on the shaft to take thrust or locate the shaft in the opposite direction as the pair. Flush ground BAC bearings are sold and packaged individually, meaning any two randomly selected “G” bearings can be mounted together. Preloaded bearings follow the common industry practice of being sold individually, but packaged in pairs. All American angular contact bearings come with a standard machined brass cage and will have an “M” suffix in their bearing numbers. Unless otherwise specified by the end user, we will supply bearings with the popular 40 degree contact angle: “B” suffix. These types of bearings are found in vertical motor, pumps, and thrust application throughout industry. We can manufacture industry standard and custom designs from 8”/200mm bore to 63”/1600mm bore.